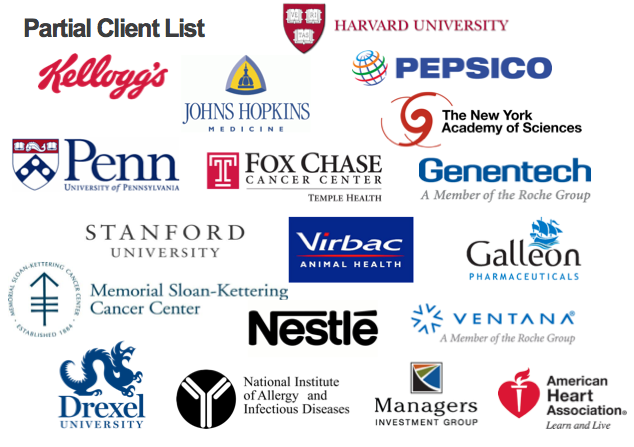 Below is a sample listing of institutional customers, however, clients also include individual professionals (all levels) in industry and academia. Listen and read for yourself what great things her clients have had to say about the high quality of the services! New York University School of Medicine, R. Tillman, Ph.D. Thank you for your fun, wonderful and enriching presentation on giving good science presentations at NYU SoM this past Tuesday…Your ability to focus on the high-impact aspects of good presentations in general and to incorporate the facets that are unique to giving memorable and effective science presentations are invaluable to the young scientists who attended. Your enthusiasm for the topic and concern for the audiences’ learning were also palpable and led to a highly motivating atmosphere. Seminar Participant, Mathieu Tamby, Ph.D.
Lisa B. Marshall is an expert in Communication and she is passionate about it. She directed a workshop on the art of networking for post-doctoral researchers at the University of Pennsylvania. She truly understands what matters the most for scientist and researchers both in academia and in the industry. She keeps her knowledge up to date by interacting with professionals. I had a wonderful experience with her personal training. I fully recommend Lisa B. Marshall. Lisa is one of the few people I know who can educate scientists about improving their communications at the appropriate level. She understands their typical situations (job-talks, seminar, conference speakers) and their typical barriers (too much information, engaging the audience. I just wanted to thank you once again for your seminar at Jefferson. The postdocs and especially the students seemed to really enjoy your presentation. I look forward to working with you again next year. Harvard University Medical School, Professor of Cell Biology, Junying Yuan, Ph.D. I would categorically recommend Lisa Marshall for any public speaking, teaching or training program. She’s more than capable, she’s sensitive to community values and issues. I heard Lisa give a workshop on scientific communication at a Symposium for Post-docs in Philadelphia in 2006. I have heard quite a few presentations on this topic and address it peripherally in my own workshops. Lisa’s presentation was the best I have seen – without a doubt. Her style is humorous without being flippant, insightful without being pedantic. She helps audience members discover their own speaking styles and illustrates her points with very effective examples. Many professors think that they are fully capable of delivering a valuable and effective lecture on scientific communication (I’ve heard a lot of them). I wish that instead they would engage the services of Lisa Marshall. She’s a real pro on this subject – and very reasonably priced, compared to others I have seen. The most important think I learned was how to better structure a talk. In particular the concept of an opening and intro with the specific examples. The section on the importance of non-content issues (eye contact) was also important (I have heard this before, but it was good to have it reinforced from another source). The specific examples of how to do things were especially helpful (e.g. the openings). This is why we wanted to the slides: even after hearing them, they are not obvious to us, and we’ll need them as reference when planning our own! I don’t think there were any sections that I would cut. I would strongly recommend this program. Your talks were a smash hit with me and all of my colleagues with whom I’ve spoken. With regard to the particularly beneficial elements, your points about slides were especially useful, particularly the critique of “real” slides. The advice regarding organization of talks and the section on handling disasters were important areas nobody ever helped me with…I would recommend this seminar with great enthusiasm to colleagues elsewhere. And, overall, I think you provided a valuable service that somehow is overlooked in educating medical faculty. Thanks and keep up the good work. University of Pennsylvania School of Veterinary Medicine, F. Wilkinson, PhD. Read the complete reference here . Lisa B. Marshall is an effective, clear communicator who is capable of teaching one of life’s most important and elusive skills–public speaking…I have been able to apply her tips and suggestions and I can see a big improvement. Read the complete reference here. One reason her program was so well received was that her material was fresh and far from generic, as opposed to the material of many vendors with whom I am familiar. Before the program, she solicited samples of slides from our faculty and worked them into her own presentation. The result was a highly customized program with examples tailored to faculty in medicine. Another reason our faculty enjoyed her presentation is the Lisa is clearly “comfortable in her own skin.” As a result, faculty who are typically introverted and occasionally antagonistic opened up and engaged in an easy give-and-take with her. This inter-activity made the session fly by. Very helpful for polishing my future talks! Thank you so much! Compelling! Attended last year–returned to pick up more fine details. Very helpful! Very helpful that it was geared toward science. So many practical tips to overcome my problems, especially based on Lisa’s experiences. This entire session was VERY, very useful for me…everything today was new, unique and exceedingly helpful. The Q&A tips were by far the most beneficial. No one ever goes over this and it is SO important. Disaster management was good too. Very practical and empowering. I found the poster delivery example and tools for dealing with Q&A issues beneficial. Thanks! Invite Lisa back. Enjoyable and went quickly. Great energy and control. Excellent organization. Interactive. Very good!! Entertaining and very informative!! I appreciate your passion!! I thoroughly enjoyed your presentation at Genentech a few weeks ago, and I though I might take you up on your offer of being a LinkedIn connection. I really appreciated the information in this session. I’ve had very few opportunities to actually learn anything about giving good presentations and I now feel that attending this event has brought me up to speed. I will certainly use the tips in the future. Also, Lisa was a very engaging speaker which made the talk fly by. Entertaining speaker. Clearly presented ideas. I felt I learned something. It was really helpful. I will try to improve my presentation according to the workshop. Thanks! The information regarding how to organize a talk and make effective slides was very helpful. I thought it was a great event. I wish I could have spent more time with Lisa. Very useful presentation and advice. Thanks. I enjoyed Lisa’s sense of humor and real life examples. It was clear that she had a great deal of experience. The most beneficial was the part of how to get audience’s attention immediately and how to appear passionate about your topic. 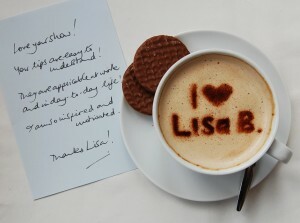 I really liked the fact that Lisa contacted me before the seminar to tailor it to fit my needs. Very useful advice. Lisa told us about some of the research that has been done on what techniques are most effective for getting your point across during an oral presentation, which I thought was pretty neat. Many more references on file and available upon request.